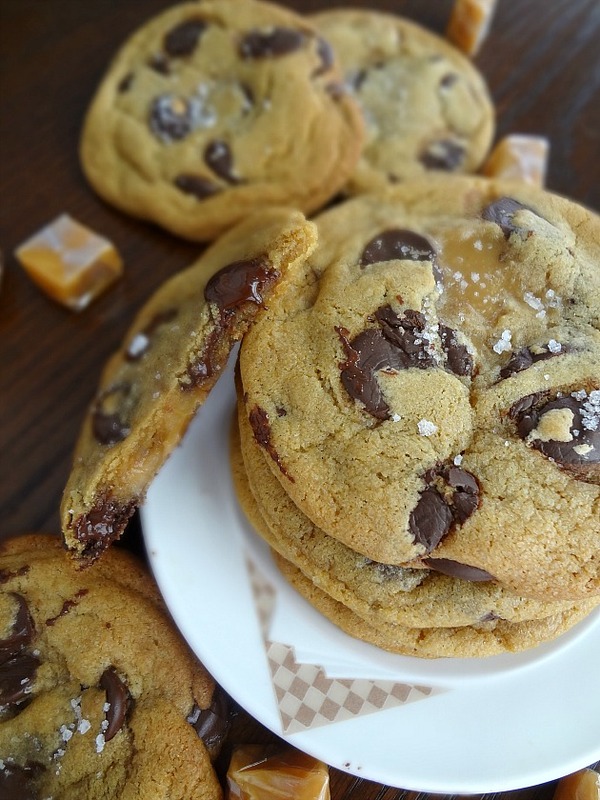 Sometimes you eat a delicious (browned butter) chocolate chip cookie (with sea salt on top) and think...you know what could make this better? If there was a salted caramel inside. And sometimes you get a bag of soft salted caramels for your housewarming. And you know what you have to do. 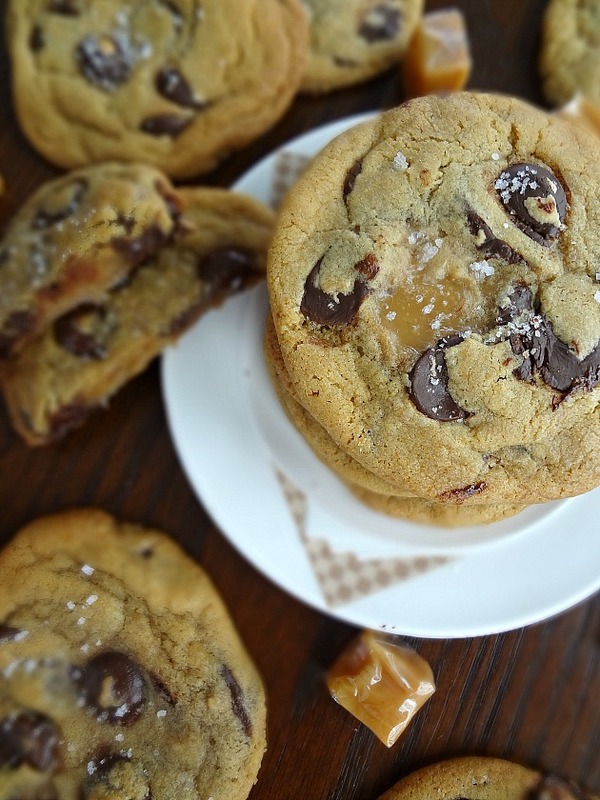 Now....in a perfect world....there would just be an even layer of caramel in the middle of the entire cookie. In my opinion. 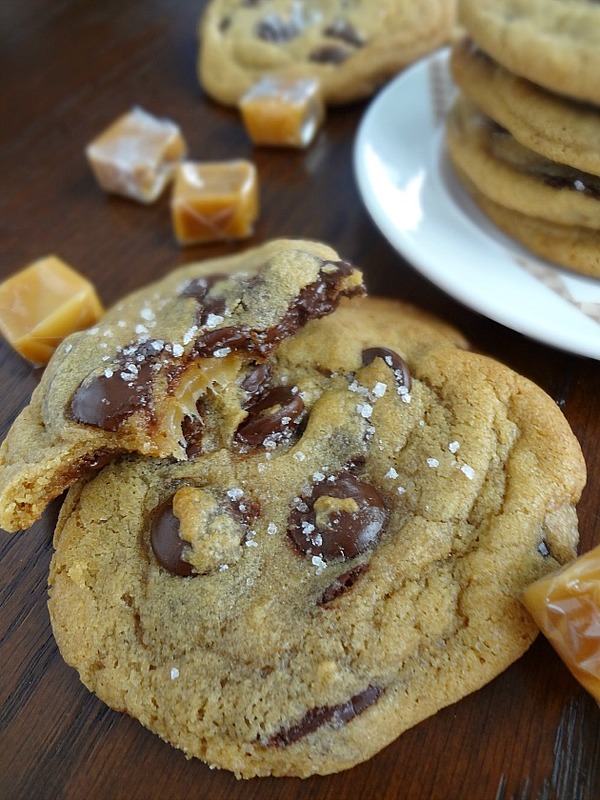 But there is something fun about the surprise of a gooey salted caramel right in the middle of your seemingly standard(ish) chocolate chip cookie. 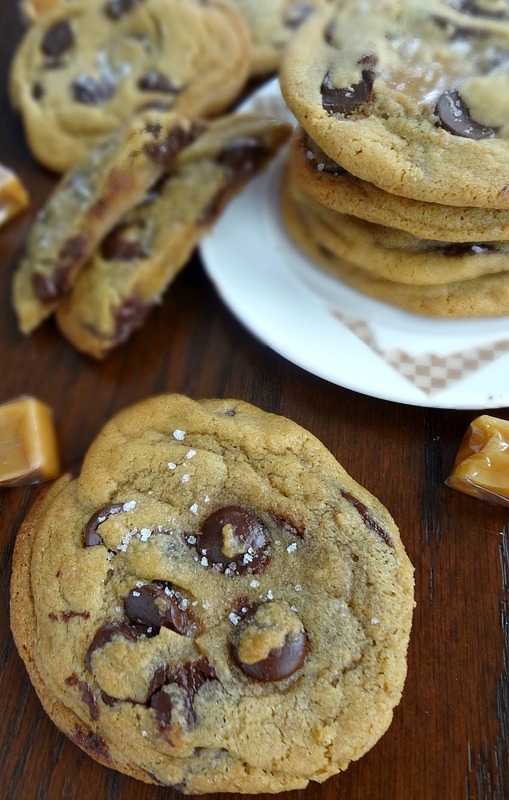 They're a fairly sturdy, yet chewy, browned butter chocolate chip cookie with yummy bites of chocolate and sea salt on top (NECESSARY!) and then you get a bit of that chewy, gooey, sweet and salty caramel. When they're warm? TOTAL MAGIC. Messy. But magical! 1/4 tesp. salt (kosher or table salt will work) if using salted butter, 1/2 tsp. if using unsalted. Place the unwrapped and ball-rolled caramels in the freezer. Place 1 stick of butter (8 tablespoons) into a small, preferably light colored, saucepan over medium-high heat. Whisk almost constantly as it foams and bubbles and little brown bits for and the whole thing turns amber. Immediately pour into a heatproof bowl (if using a stand mixer later, you can use the bowl of your stand mixer). Stir in the remaining stick of butter and whisk until completely smooth. Place the bowl in the refrigerator or freezer and bring the butter back to room temperature-for about 30 minutes, you'll know it's right when you press a finger into it and it leaves an indentation. Once the butter has reached room temperature, preheat the oven to 375F degrees and line a large baking sheet with parchment paper. In a medium bowl whisk flour, baking soda, and salt together. Add the sugars and vanilla to the bowl with the butters and, using the paddle attachment on a stand mixer or just a handheld electric mixer, beat on medium-high speed until light and fluffy, about 2 minutes. Using a rubber spatula fold in the dry ingredients just until combined. Gently stir/fold in chocolate chips/chunks. Scoop out a two tablespoon round of dough, roll it into a ball, and place on prepared baking sheet. Gently press the frozen caramel into the center (don't press into the bottom very far, just press it enough so it stays), then top with another 2 tablespoon sized round of dough, pinching the edges closed to seal the caramel in dough completely-repeat with all the dough (you will need to do batches with the baking sheet, while you wait for a batch of cookies to bake you can store the rest of the dough in the refrigerator for a bit.) Sprinkle the top of each dough ball with some sea salt. Bake for 11-14 minutes, until golden around the edges but still somewhat soft in the middle. Top with more sea salt, if desired. Let cool for 5 minutes on the sheet before transferring a a cooling rack. 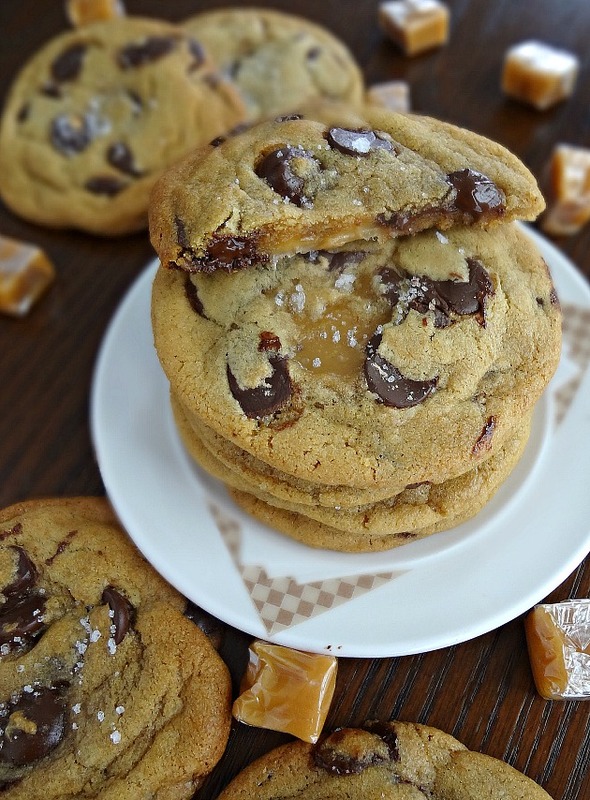 Oh hi gooey salty caramel. You are my friend.